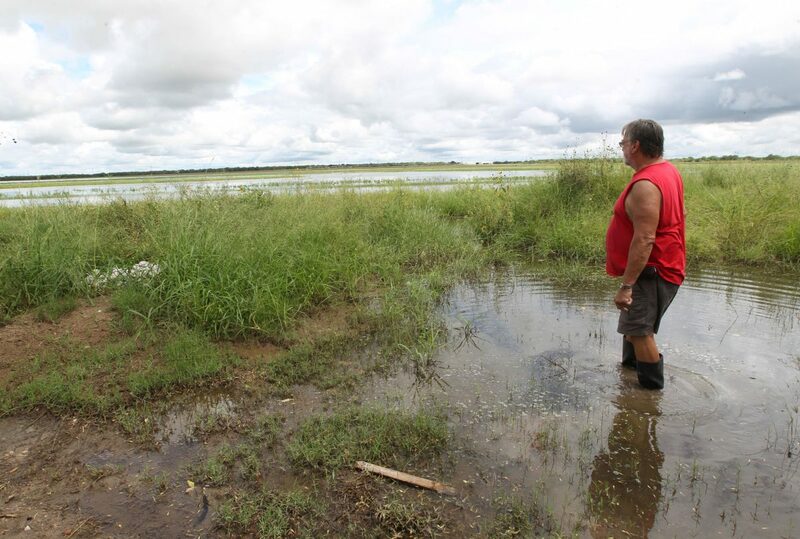 Jay Willis stands in water from the overflow drainage ditch near his property at the Sand Piper Resort off Seminary Road and Calichera on Saturday, Sept.15, 2018, in Edinburg. Hidalgo County voters are to be applauded for investing in their future safety. By a 2-to-1 margin, they approved a $190 million bond proposal to fund 37 drainage improvement projects throughout the county, and the purchase of equipment to maintain them. Widespread flooding in June revealed just how vulnerable parts of the county are to damage from heavy rains. The planned projects should help mitigate those risks by reducing flooding and the damage it invariably causes. Drainage District No. 1 Manager Raul E. Sesin, on the district’s website, notes that drainage systems in some parts of the county were designed to serve the agricultural use that was prevalent when the systems were first built. Population growth and urbanization have changed both the land use and the areas’ needs over time, Sesin indicated. The bonds will cost county property owners an additional 3 cents per $100 in property tax assessments. But the improvements should save many of those same property owners even more by reducing the risk of future flood damage to their homes and businesses. Sesin also has noted that because all the projects won’t be undertaken at once, the bonds will be sold, and taxes raised, incrementally. The tax increase might only be one-half cent the first year, he told our reporter Cristina M. Garcia. Assurances that the taxes will only be raised as needed, and full definition of each project before the bond proposal was brought to voters, is a welcome sign that these improvement projects have been well thought out and officials recognize the need to be responsible and frugal with taxpayers’ money. The several public forums that preceded the vote raise our confidence that the county will maintain full transparency and consideration of the public’s needs. We trust that proper planning will continue throughout the life of the projects. That includes utilizing engineers who can best address the special needs for drainage systems in a flood plain such as the Rio Grande Valley. They also should pay special attention to the projects at the southern end of the county that might be affected by the federal government’s proposed border wall. That structure might require unexpected changes due to water diversion, erosion or access that could affect future drainage patterns. Certainly, it’s impossible to completely eliminate all risk of flooding; a storm strong enough to overwhelm even the best precautions is always a possibility. But the improvements should help reduce the chances that lesser storms, or prolonged rainfall, might create the same damage that it has in the past. The public has placed its faith, and invested its money, in the county’s promise of working to make their neighborhoods safer. We trust that faith will be rewarded through fewer and less-severe flooding problems during future storms.